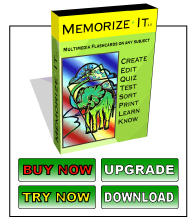 Memorize-It is targeted specifically for college students. It's main intention was to allow a busy person to quickly start studying exactly the information that they need to learn. No matter what that information is, if you could write it on a paper flaschard, you could more quickly create an electronic flashcards. That was the goal and that is the reality. I personally have used it in foreign language, GRE, acronyms, art history, chemistry and guitar. College student's don't have a lot of time to spare. If you are looking for a good gift for a student, this $25 software will be one of their best tools in getting better grades in college. If you are looking for the perfect gift for a college student, this is it.